Taraweeh: 8 or 20 Rakats? I wanted to ask where does the tradition of praying 8 rakat tarawih come from and is it permissible for us to pray 8 rakats only? Is Tarawih 8 Or 20? For the past fourteen hundred years, the Ummah has been performing twenty Rakaats of Taraweeh without a question. However “a sect” now claims that Taraweeh is ONLY eight Rakaats, which implies that for fourteen hundred years the Ummah had deviated from the Sunnah of Nabi (Sallallahu Alayhi Wasallam) and had performed twenty Rakaats without any Shari proof. The commentator of al-Sahih al-Bukhari and the erudite traditionist, Shaykh Shamsud-Din al-Kermani (d. 786 AH; RH) said: 'In the Hadith (above), the Tahajjud prayer is meant. Abu Salama's question and Hadrat Aisha's answer concerned the Tahajjud.' He adds further: 'If the Tahajjud prayer is not meant, then this tradition will be at variance with the tradition that states that the Holy Prophet (Peace be upon him) led twenty Rak'ahs each for two nights, and in the case of such clash the tradition of twenty Rakah's which is affirmative (Muthbit) shall have precedence because according to the principles of Hadith, the affirmative takes precedence over the negative (Naafi)" (vide: Al-Kawakib ud-Durari Sharh Sahih al-Bukhari, vol. 9, pg 155-156). We say, does this not mean that people who perform 8 Rak'ahs of Taraweeh, should pray 20 Rak'ahs instead? Since according to the principles of Hadith, "The affirmative takes precedence over the negative in certain cases." A great fact that should also be noted is that the Imam's of Hadith have placed the Hadith from Sayyidah Aisha (RA) under the section of Tahajjud prayers, which indicates their belief that the Hadith applies to Tahajjud only. The Imam al-Muhaddithin al-Bukhari has placed the Hadith from Sayyidah Aisha under at least two sections of his Sahih, first under the section of '21: The Tahajjud Prayer at Night' (see Sahih al-Bukhari, vol. 2, chapter 15, no. 248, English ed'n) and then under the section of '32: The Book of Taraweeh Prayers' (see Sahih al-Bukhari, 3/230, pg. 128 English ed'n). This means that al-Imam Bukhari believed that the prayer mentioned by Aisha was that of Tahajjud only, and since the Tahajjud prayer is performed also in Ramadan, then Imam Bukhari also quoted the same Hadith under 'The book of Taraweeh prayers', but Allah knows best. Imam Muslim has also placed the Hadith from Aisha under the Tahajjud prayer section (see Sahih Muslim 1/1607, pg. 356, English ed'n). Also Imam Malik has placed Sayyidah Aisha's Hadith under the Book of Tahajjud (see Al-Muwatta, Book 7, section 7.2, no. 9, pg. 5, English ed'n). Al-Imam Abi Dawud has also placed the same Hadith under the chapter 'On the number of Rak'ahs of the prayer at night (Tahajjud)' (see Abi Dawud 1/1336, pg. 351, English version). Even Imam's Tirmidhi and Nisai (Allah's mercy be upon them) placed Aisha's Hadith under the Tahajjud section (see Tirmidhi, vol. 1, pg. 58 and Nisai, vol. 1, pg. 154). Ibne Hajar states that in Bukhari the chapter of Tahajjud, Witr, and Nawafil prayers are mentioned separately, so this indicates that Imam Bukhari did not place Tahajjud, Witr and optional prayer into one chapter, but into different, separate chapters. This proves that Tahajjud and Tarawih prayers are separate prayers, if however, the Tahajjud and Tarawih prayer was the same-as some people (Salafis) say, why didn’t Imam Bukhari mention Tarawih and Tahajjud prayer into one chapter or book? If someone makes a claim that there is no distinction between Tahajjud and Taraweeh. For 11 months it is called Tahajjud and in Ramadhaan it is called Taraweeh. In response to this we would question: What is the proof for this claim? And when there are numerous distinctions existing, then how is it possible to regard both as one? 2. Everyone agrees that the number of Rakaats of Tahajjud have been transmitted by Rasulullah (sallallahu alaihi wasallam), the maximum being 13 including Witr and the minimum being 7 including Witr. However no specific number has been transmitted from Rasulullah (sallallahu alaihi wasallam) regarding Taraweeh as clearly stated by Allamah ibne Taymiah. Therefore the Aimma-e-Mujtahideen differ in the number. Some say 20 and some say 36, even more. 3. Tahajjud was ordained in Makkah whilst Taraweeh was prescribed in Madina. 5. Tahajjud is generally performed after sleeping while Taraweeh is performed after Esha. From the above we learn that Taraweeh and Tahajjud are separate Salaahs. This Hadith apparently indicates that Nabi (Sallallahu Alayhi Wasallam) performed eight Rakaats and three Rakaats Witr, In other Ahadith it is stated that Prophet (Sallallahu Alayhi Wasallam) prayed more than 8 and less than 8 Rakats, i.e. she said, "He observed 13 Raka'ahs (in the night prayer). He observed 8 Raka'ahs and would then observe (three Rak'ahs of) Witr and then observe two Raka'ahs sitting (Nafl prayer), and when he wanted to bow he stood up and then bowed down, and then he observed two Raka'ahs in between the Azan and Iqama of the dawn prayer (i.e. Fajr)." (Sahih Muslim 1/1603, pg. 357). Now we can see clearly from these traditions that it contradicts with the proof and evidence (The Hadith Aisha RA)) of the Ghair Muqallids (those who do not follow a Madhab (one of the school of thought)) . Note: In the following paragraphs we will be analyzing the Hadith of Aisha (RA), so make sure you refer to it. However, the Hadith of A’isha doesn’t refer to Taraweeh Salaat but refers to Tahajjud. 2) This hadith states, that Prophet (Sallallahu Alayhi Wasallam) prayed this Salat by himself, and the Witr prayer also. This is very clear in the text (Hadith). -Ghair Muqallids say it is prayed with congregation and the witr prayer also. 3) This hadith states, that Prophet (Sallallahu Alayhi Wasallam) prayed this prayer at home. This is clear that Aisha (RA) is mentioning it at home. -Ghair Muqallids say that it is prayed in the Masjid. In this verse we can see clearly that Prophet (Sallallahu Alayhi Wasallam) was ordered to rise (from sleep) for Tahajjud prayer and he also use to pray Witr prayer, as this was the practice of Rasulullah (Sallallahu Alayhi Wasallam). -Ghair Muqallids say, that the witr prayer is immediately prayed after tarawih Salat (Prayer). -Ghair Muqallids say, that this prayer is prayed with 2 Rakats . The belief of the Ghair Muqallids on 8 Rakat Taraweeh contradicts in every direction with the Hadith of A’isha (RA), which they hold evident and using their utmost effort to prove that the Tarawih prayer of Rasulullah (Sallallahu Alayhi Wasallam) was 8. However, this proof is useless and baseless. From this we also learn that according to some people themselves it is not compulsory to practice upon this Hadith nor is going against this Hadith opposing the Sunnah. In such a situation to use this Hadith as a proof against anyone else or to prove any claim is gross injustice and against the dictates of piety. There are some who say that if anyone performs more than 11 Rak'ahs of Taraweeh, then he or she is basically committing a Bid'ah (a very bad innovation)! We seek refuge in Allah from such a disgusting statement! Since this tantamountally means that the foremost Imams of the saved sect (al-Firqat an-Najiyyah) of Ahl-al-Sunnah wa'l-Jama'ah have been committing a gross innovation (Allah forbid). Such a person seems to be implying that the venerable Sahaba kiram (RA), the four great Mujtahid Imams (RH), as well as the foremost scholars of Hadith and Fiqh of the last 1400 years have 'innovated' the practise of 20 Rak'ahs of Taraweeh, if considered in the light of penetrative elaboration, implicitly and covertly! Laa Hawla wa Laa Quwwata Illaa Billaah il-Aliyy il-Azeem! If I pray 20 rakah I wont have any doubts that I'm not doing anything wrong. In a narration it is stated that the Messenger of Allah (Allah bless him and give him peace) performed twenty rak’ahs in tarawih. The chain of this narration is weak. However, it is a well established principle in the sciences of Hadith and Fiqh that if a hadith possesses a weak chain but is supported by the general practice of the Ummah in the era of the Companions and the Followers (Tabi’in) then that hadith will be considered authentic. Interestingly, Imam Ibn Abi Shaybah, under the chapter of “The number of rak’ahs to be performed in Ramadan”, first quotes the practice of twenty rak’ahs from ten different Companions and Followers (Tabi’i) and thereafter cites the narration of twenty rak’ahs from the Messenger of Allah (Allah bless him and give him peace). This probably means he was alluding to the strength of this narration. Imam Abu Hanifa, Imam Shafi’i, and Imam Ahmad (rahmatullahi alaihim) are unanimous that twenty rak’ats are to be performed for taraweeh during Ramadan. There are different opinions recorded from Imam Malik (rahmatullahi alaih): one states twenty rak’ats; another is of thirty-six rak’ats, about which Imam Malik (rahmatullahi alaih) said, ”This is our former opinion;” and a third view is of thirty-eight rak’ats. There is also an opinion which states forty-one rak’ats (Bidayat al-Mujtahid 1:210). ‘Allama ‘Ayni (rahmatullahi alaih) mentioned the second of view of thirty-six rak’ats to Imam Malik’s (rahmatullahi alaih) more popular opinion. Therefore, since taraweeh was performed as twenty rak’ats, consisting of five sets of four rak’ats (each set called a ‘tarweeha’), the people of Madinah would perform an extra four rak’ats after every tarweeha, bringing the total number of extra rak’ats to sixteen. Sixteen extra rak’ats plus the twenty rak’ats of taraweeh make thirty-six rak’ats. Hence, the actual number of tak’ats of Taraweeh was twenty even according to Imam Malik (rahmatullahi alaih). Imaam Nawawi radhiallahu anhu states: “Taraweeh is a unanimously accepted sunnah of the Muslims. It is twenty rakaats”. “The pandemonium that the Ghair Muqallideen (people who do not follow any Mazhab) had started for the past hundred years was never heared of in the Islamic world before……… Similarly from the time of Umar radhiallahu anhu upto the emergence of this sect there was no masjid in the world where eight rakaats of Taraweeh was performed……”. (Moulana Habib ur Rahmaan Azmi). The proponents of eight rakaats taraweeh quote the following hadeeth of Ayesha radhiallahu anha as stated in Bukhari Shareef. Ayesha radhiallahu anha was asked about the salaat of Nabi sallallahu alayhi wasallam. She replied by saying that Nabi sallallahu alayhi wasallam did not exceed eleven rakaats in Ramadhaan nor in any other month…”. Tarawih; 20 rak’ats. No less! The issue of Taraweeh exposes thoroughly the falsity and hollowness of the claims of the Salafi sect of being faithful representatives of the Salaf-us-Saliheen – the first three generations of this Ummah regarding whom Rasulullah (sallallahu alayhi wasallam) testified to their superiority. Any ‘Deen’, such as that expounded by the Salafis, modernists and other deviant sects, which is at variance with the Deen of the Salaf-us-Saliheen is a deviated imposter of a ‘Deen’ which has no relation to the blessed Sunnah of Rasulullah (sallallahu alayhi wasallam). Even a perfunctory perusal of the rulings of the Salaf-us-Saliheen as transmitted by all the early Fuqaha reveals the fact that there was complete Ijma’ (consensus) of the Salaf-us-Saliheen, including the Sahabah (radhiyallahu anhum), that Taraweeh consists of 20 raka’ts of congregational prayers. This was the position of ALL the Aimmah Mujtahideen, the authoritative scholars of the Salaf-us-Saliheen, who based their ruling on the Ijma’ (consensus) of the Sahabah (radhiyallahu anhum). While the Salafi and modernist sects of today continue to conjure up various different opinions, ranging from 20 rakat’s being branded a Bid’ah (al-Albani, Ahlul Hadeeth, & co.) to the overwhelmingly liberal trend today of 8 raka’ts, 2 rakat’s, half a raka’t, and anything and everything being ‘valid ikhtilaaf’, the ONLY ikhtilaaf transmitted from the Salaf-us-Saliheen is in regards to the extra four raka’ts of Nafl prayed individually in the period of rest that would occur after every four raka’ts during the 20 raka’ts of congregational prayer. As shall be demonstrated, while the Salaf-us-Saliheen of Makkah Mukarramah would perform Tawaaf during these 4 periods of rest, the Salaf-us-Saliheen of Madinah Munawarrah would pray 4 raka’ts individually, thus bringing the total to 20 + 4 x 4 = 36 raka’ts. Another 3 raka’ts or 5 raka’ts or Witr would bring the total number in Madinah to 39 or 41 respectively. However, in terms of the 20 raka’ts of congregational prayers, there was absolutely no difference amongst the Salaf-us-Saliheen. Before providing a brief background on the basis of the ruling of the Salaf-us-Saliheen, and casting a cursory look into the blessed environment in which the four Imams and other Imams of the most superior of generations of this Ummah had begun the codification, systemization, and compilation of the Deen of the Salaf-us-Saliheen, we shall first quote Allamah Ibn Qudamah, whom even the Salafis accept to be amongst the most authoritative transmitters of the rulings of Imam Ahmad ibn Hanbal, to serve as a useful summary of view of the Salaf-us-Saliheen with regards to the Taraweeh prayers. Here ends the excerpts from Allamah Ibn Qudamah which is merely a re-iteration of what innumerable early Fuqaha have transmitted from the best of generations. A glimpse into this mass-transmission of the ruling of the Salaf-us-Saliheen will be given in this article insha-Allah. Before proceeding, it must be noted that the early Fuqaha did not pull the rulings they had written down out of their back pocket. They were not reliant on a few copies of Bukhari Sharif, Muslim Sharif, Al-bani ‘Sharif’ etc. they happened to stumble across in their living room, nor were they reliant on Hazrat Google Sharif, or a smattering on Arabic they happened to learn on the side during a life-time of indulgence in Haraam and Mushtabah (doubtful) matters. These Ulama were Paragons of piety, immersed in Zikrullah, who understood that the Noor of Ilm (Knowledge of the Deen), and its correct understanding, was purely ‘wahbi’ i.e. divinely bestowed by Allah (azza wa jal) and thus completely dependent on Taqwa, Wara’ (abstinence from even permissible matters), and firm adherence to every minute Sunnah of Habeebullah (sallallahu alayhi wasallam). Such Ulama-e-Haqq acquired all their knowledge directly from numerous other Ulama-e-Haqq, often numbering in the hundreds, who themselves acquired their Deen from their numerous teachers, and so on, through continuous, unbroken chains that would stretch just a few generations back to the Imams of the Salaf-us-Saliheen. Thus, when Hafiz Ibn Qudamah or Imam Nawawi affirms that Imam Ahmad ibn Hanbal or Imam Shafi’i, who were the leading scholars of the third and final tier of the Salaf-us-Saliheen, held the position that Taraweeh is 20 raka’ts, then such attributions are based on a firm conviction stemming from a direct acquisition of knowledge from a multitude of Ulama-e-Haqq who in term had acquired their knowledge from another multitude of Ulama-e-Haqq, and so on, through multiple Sanads (chains) consisting of only a few names between them and the Imams of the Salaf-us-Saliheen. In any case, statements from the Imams of the Salaf-us-Saliheen themselves, and their direct students, will be produced to confirm the unanimous ruling of 20 raka’ts based on the Ijma’ of the Sahabah (radhiyallahu anhum), and recorded by all the early Fuqaha of this Ummah. We shall now provide a snapshot of the Taraweeh Amal (actual practice) of all the Salaf-us-Saliheen – a practice that was mass-transmitted from generation to generation before being recorded in detail in the authoritative books of Fiqh of all Madh-habs. The fact that every report of the Fuqaha-e-Mutaqaddimeen (the early Fuqaha during and in close proximity to the era of the Salaf-us-Saliheen) pertaining to the Taraweeh Amal (actual practice) of the Salaf-us-Saliheen conforms exactly to what Allamah Ibn Qudamah stated, leaves not the slightest doubt that the minimum base of 20 raka’ts was the unanimous practice of the Salaf-us-Saliheen. While reading the eye-witness accounts, testimonies, and ruling of the Salaf-us-Saliheen with regards to Taraweeh below, bear in mind that the specification or special emphasis on a particular number that is not explicitly found in the Sunnah causes a practice to become a reprehensible Bid’ah according to Ijma’ (consensus). To illustrate this concept of Bid’ah, if a Salafi mutation today were to introduce a “fast-track” or “instant” Taraweeh of 4 raka’ts in mosques around the world, or another deviant sect were to extend the 20 raka’ts Taraweeh practice of Ramadhan to other sacred months of the year, believing that Taraweeh is just another name for Tahajjud and thus permissible throughout the whole year, then such innovations would be classed as reprehensible Bid’ahs according to the Shariah. According to this principle of Bid’ah which the Salafis accept wholeheartedly, Imam Ahmad ibn Hanbal, Imam Shafi’i, and the Salaf-us-Saliheen who all condoned and adopted the widespread specification of 20 raka’ts for Taraweeh, as shall be demonstrated below, were all completely complicit in the perpetration of wholesale Bid’ah. Bear in mind that there existed literally hundreds of thousands of Ulama-e-Haqq besides the Four Imams during that blessed era, each one the staunchest upholder of the Haqq who would never have hesitated for a second in condemning most vociferously the slightest of deviations. Such Ulama bore not the slightest resemblance to the so-called “Ulama-e-Haqq” of today whose salient feature is cowardice and Kitmaanul Haqq (being silent regarding the truth). Yet not one authority who witnessed and transmitted the practice and ruling of Imam Ahmad Ibn Hanbal, Imam Shafi’i, Imam Malik, Imam Abu Hanifah, etc. have reported anything different to what Allamah Ibn Qudamah has stated with regards to the Amal (practice) of the Salaf-us-Saliheen. And not one record exists of a single objection from the droves of Ulama-e-Haqq of the Salaf-us-Saliheen and of subsequent generations regarding the Bid’ah specification of a number not found in the Sunnah. Perhaps the Salafis believe that Imam Shafi’i and other Imams of the Salaf-us-Saliheen were hallucinating when they explicitly testified to having witnessed the Salaf-us-Saliheen of Makkah, Madinah, Iraq, etc. to be praying 20 raka’ts? Or perhaps all the Salaf-us-Saliheen at some point in time conspired together in all the lands to displace the Ijma’ practice of the Sahabah (radhiyallahu anhum) and secretly institute a Bid’ah, while simultaneously managing to silence the hundreds of thousands of Ulama-e-Haqq who would have existed during that era and in subsequent eras? Or perhaps Taraweeh was an intensely dark, obscure and private matter that was surreptitiously enacted in all the mosques of the Ummah, including the Haramain (Makkah and Madinah), thus making it an extremely complex task for the Four Imams and other Fuqaha to surgically extract the number of raka’ts from the crowds of masses, including themselves, who all would have been participating fervently in this mysterious practice for hours on end, every evening during Ramadhan? Perhaps when Hazrat Umar (radhiyallahu anhum) re-enacted the Taraweeh prayers in congregation, based on the Sunnah of Rasulullah (sallallahu alayhi wasallam), and accepted by the Ijma’ of the Sahabah (radhiyallahu anhum), the subsequent generations of Salaf-us-Saliheen somehow lost count of the number of raka’ts they had witnessed first-hand and been taught to pray, and 8 raka’ts transformed instantly into 20 raka’ts? Or perhaps this issue serves as yet another example that exposes vividly the massive disparity that exists between the Maslak (way) of the Salaf-us-Saliheen and the Maslak of the Salafis, whose satanic “success” in this age in displacing so widely the exact Taraweeh practice of the Salaf-us-Saliheen demonstrates the lethal potential of the Salafi methodology to transform and mutate the Deen of the Ummah within a matter of a few years. Opinion of Hanafi Imams, taraweeh 8 or 20? The below is been floated by salafis to confuse the simple minded Muslims. 1) Ibn Hammaam Hanafi says: “And the conclusion for all this is that the Sunnah Qiyaam (of) Ramadan (Tarawih) is 11 Rakaat with witr in congregation.”[Fathul Qadeer Sharhul Hidaya vol 1 Page 407] and then he goes on and say 20 is sunnah of Khulafa al Rashideen. 8) Abdul Hayy Lakhnavi writes that: “the prophet pbuh performed taraweeh in 2 ways. Further he states in Faizul Baari 2/420 that Umar ibn Al Khattaab Radhi Allahu Anhu considered taraweeh and tahajjud to be the same. Question: The reason for posing this question is that a Ghayr Muqallid by the name of Molvi Abdul Jaleel Saamrodi is creating havoc by publishing an article in a Gujarati newspaper that there is no proof for the Taraaweeh salaah being more than eight Rakaahs. He challenges people to prove even from a weak Hadith that Rasulullaah (SAW) performed twenty Rakaahs of Taraaweeh. Would you please furnish the details of the twenty Rakaahs of Taraaweeh salaah because the people are greatly confused. Answer: What a disservice to the Deen it is to start the debate of twenty Rakaahs Taraaweeh salaah at a time when most Muslims are not even performing their salaah and the Masaajid are left deserted! At a time when Muslims are concerned about those afflicted with disasters all over the world, someone like Saamrodi offers a challenge of thousands of Rupees to anyone contesting the issue of twenty Rakaahs Taraaweeh! Even death is better than a perverted understanding of matters. It is irresponsible acts like this that have given Saamrodi and his group a bad name. In fact, people with a clear understanding of matters steer clear from them and refer to him as Saamiri (the deceitful hypocrite during the time of Hadhrat Moosa (RA)). The editor of the Delhi Tarjumaan newspaper has written the following in the 1 October 1957 edition in an article titled ‘Saamiri’s evil’: “The hallmark of this strange man is to create havoc and all his life has instigated waves of conflict in peaceful environments. He has therefore been likened to the instigator Saamiri.” His leader from the Ahle Hadith Moulana Thanaa’ullaah held the beliefs of the Mu’tazilahs, Jahmiyyahs and naturalists. When Hadhrat Abdullaah bin Abbaas (RA)went to reason with them, he asked them what their grievance against Hadhrat Ali (RA)was. They said that Hadhrat Ali (RA)appoints people as arbiters and heeds to their decisions, whereas this opposes the Qur'aan which states: “All decisions rest with Allaah”. Hadhrat Abdullaah bin Abbaas (RA)then explained to them that the Qur'aan actually instructs people to appoint arbiters. In the case of a person in Ihraam hunting an animal, the Qur'aan declares that two just people should be appointed to decide the precise animal to be given in compensation. Furthermore, in the case of a dispute between a couple, the Qur'aan enjoins that an arbiter from the husband’s side and another from the wife’s side should negotiate a settlement. Just like them, Saamrodi also fails to understand the Qur'aan. He shouts slogans of “Obey Allaah and the Rasool ” and advocates following the Ahadeeth, but then closes his eyes to other verses of the Qur'aan, to other Ahadeeth and the practices of the Sahabah (RA). Whereas the Khawaarij labelled only Hadhrat Ali (RA) and his companions as misguided people, Saamrodi labels every follower of the Deen for the past thirteen hundred years as misguided people and opponents of the Sunnah and the Ahadeeth. The group he labels include the Sahabah (RA), the Taabi’een, the Awliyaa, the Mashaa’ikh and even Imaam Abu Haneefah (RA), Imaam Shaafi’ee (RA) Imaam Maalik (RA) and Imaam Ahmad bin Hambal (RA) He regards the twenty Rakaahs of Taraaweeh that they all performed a deception (Allaah forbid!). Saamrodi’s challenge is just like a person who claims that the Qur'aan says, “Do not perform salaah” but omits the next part of the verse that reads, “…when you are in the state of intoxication” or one who advocates a free reign in eating and drinking by claiming that the Qur'aan states “Eat and drink” but omits to mention the next part of the verse that reads “but do not be extravagant”. May Allaah save us from Saamrodi’s audacity. He quotes extracts from Tahtaawi, Ashbaa, Maraaqil Falaah, Moulana Nanotwi (RA)’s Maktoobat, Moulana Anwar Shah (RA)’s Urfush Shazi, Allaama Ibn Humaam (RA)’s Fat’hul Qadeer, Allaama Ayni (RA)’s commentary of Bukhaari, Allaama Halabi (RA)’s Kabeeri, Mulaa Ali Qaari (RA)’s Mirqaat and from Allaama Tahaawi (RA) . However, these extracts have been quoted out of context, incomplete and twisted to suit himself. We shall now present the words of these scholars to you. TAHTAAWI: After a lengthy discussion, Allaama Tahtaawi (RA) states: “This narration from Hadhrat Abdullaah bin Abbaas (RA)makes it evident that twenty Rakaahs Taraaweeh salaah has been proven as an act of Rasulullaah (SAW).” He further states that the practice of twenty Rakaahs with ten Salaams has been passed down from generation to generation. MARAAQIL FALAAH: “The Taraaweeh salaah is Sunnah Mu’akkadah and it comprises of twenty Rakaahs with ten Salaams by the consensus of the Sahabah (RA) and has been passed down from generation to generation. AL ASHBAA WAN NADHAA’IR: “The Taraaweeh salaah comprises of twenty Rakaahs with ten Salaams”. LATAA’IF QAASIMI: Hadhrat Moulana Qaasim Nanotwi (RA) writes: “An act that the Sahabah (RA) carried out regularly is Sunnah Mu’akkadah because Rasulullaah (SAW) said, “Hold fast to my practices and the practices of the rightly guided Khalifahs.” He writes further, “Twenty Rakaahs Taraaweeh has been proven from the end of Hadhrat Umar (RA)’s Khilaafah by consensus of the Sahabah (RA). It is therefore a Sunnah and whoever denies it being such is misguided and wrong.” In his Tasfiyatul Aqaa’id, his Fatwa states the same and will be quoted at the end with the question. Allaama Anwar Shah Kashmeeri(RA): In his commentary of Tirmidhi called Urfush Shazi, Hadhrat Allaama writes: “None of the four Imaams advocate anything less than twenty Rakaahs and this was the practice of the consensus of the Sahabah (RA). In fact, Imaam Maalik (RA) is of the opinion that the Taraaweeh salaah comprises of 36 Rakaahs. He explains further that while the people of Makkah performed Tawaaf during the rest period between every four Rakaahs of Taraaweeh, the people of Madinah were unable to do so. To compensate for this, they performed four Rakaahs salaah individually during this period, because of which they eventually performed 16 extra Rakaahs, making it a total of 36.
periods of Hadhrat Umar (RA), Hadhrat Uthmaan (RA)and Hadhrat Ali (RA). quoted it again in his discussion of the Taraaweeh salaah being twenty Rakaahs. Taraaweeh salaah comprises of twenty Rakaahs. Quote and in brackets add their own commentary giving the impression that the words in brackets are those of the author. Most devitated groups use the above nefarious tactics. Be awake and may Allaah save us all. Let us now focus on the Sahabah (RA) and examine their thinking, their inclinations and aversions. 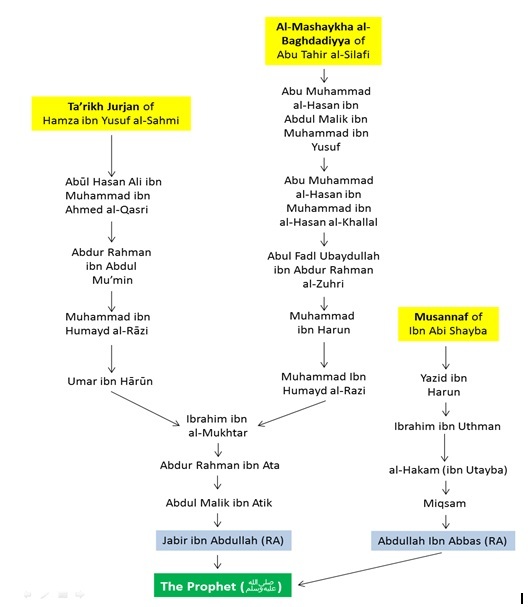 They were the illustrious group whom Allaah selected to be companions of His beloved Nabi (SAW). They were the bearers of Rasulullaah (SAW)’s message to all of mankind to come until Qiyaamah. Their fervour for the preservation of the Deen was therefore so intense that there is no group after them who ever detested acts of Bid'ah as much as they did. Hadhrat Mujaahid (RA) reports that they were with Hadhrat Abdullaah bin Umar (RA)in a Masjid when after the Zuhr Adhaan, the Mu’adhin called out “As Salaah! As Salaah!” Hadhrat Abdullaah bin Umar (RA) exclaimed, “Take me away from this person who practises Bid’ah.” He then left and performed his salaah elsewhere. NOTE: If the Sahabah (RA) could not tolerate adding an announcement after the Adhaan, could they ever tolerate a salaah of twenty Rakaahs? Hadhrat Abdullaah bin Abbaas (RA) was once performing Tawaaf with Hadhrat Mu'aawiya (RA). When Hadhrat Mu'aawiya (RA) kissed all four corners of the Kabah, Hadhrat Abdullaah bin Abbaas (RA) told him that Rasulullaah (SAW) kissed only the Rukn Yamaani and the Hajar Aswad. “But no part of this Kabah deserves to be left out,” Hadhrat Mu'aawiya (RA) remarked. To this, Hadhrat Abdullaah bin Abbaas (RA) recited the verse, “There is indeed a sterling example for you in Rasulullaah (SAW).” Hadhrat Mu'aawiya (RA) agreed that he was right. NOTE: When a person cannot tolerate that the Kabah be kissed in conflict with the Sunnah of Rasulullaah (SAW), how can he tolerate that a Bid'ah be perpetrated in the Masjidul Haraam and Masjidun Nabawi? When Hadhrat Abdullaah bin Abbaas (RA) saw Hadhrat Tawoos performing Nafl salaah after the Asr salaah, he stopped him, telling him that it was in conflict with the Sunnah. Now when Hadhrat Ali (RA) regarded performing Nafl salaah in conflict with the Sunnah to be a cause for punishment, why did he not stop the twenty Rakaahs of Taraaweeh salaah and even appoint an Imaam to lead it? When Hadhrat Abu Sa’eed Khudri (RA) saw the Khalifah Marwaan delivering the Khutbah before the Eid salaah, he stopped him, saying that it opposed the Sunnah. Hadhrat Abu Moosa Ash’ari (RA) was the governor of Kufa and Hadhrat Salmaan bin Rabee’ah (RA) was the judge of Kufa at the time when they both issued a verdict that a daughter and a sister should each receive half the estate of a deceased while the grand daughter received nothing. They then sent the questioner to Hadhrat Abdullaah bin Mas’ood (RA) for confirmation. Hadhrat Abdullaah bin Mas’ood (RA) however disagreed and immediately said, “I cannot say something that opposed what Rasulullaah (SAW) did, otherwise I would go astray.” According to what Rasulullaah (SAW) said, he then gave half the estate to the daughter, a sixth to the grand daughter and the remainder to the sister. Muhammad ! It is so sad to see how fast you are heading for destruction! salaah before Surah Faatiha, his father said, “Dear son! That is an act of Bid’ah. never heard any of the them recite it (loudly), so do not do so"
NOTE: Why did no one speak out when twelve Rakaahs were added to eight? replied, “That is a Bid’ah. did teach us was to recite “Alhamdulillaah alaa Kulli Haal”. salaah in the Masjid was in conflict with the Sunnah of Rasulullaah (SAW). Now if the twenty Rakaahs Taraaweeh salaah was not performed by Rasulullaah (SAW) and conflicted with the Sunnah, is it not surprising that the Sahabah (RA) allowed it to take place? NOTE: If twenty Rakaahs Taraaweeh opposed the Sunnah of Rasulullaah (SAW), why did no one point this out to Hadhrat Umar (RA)? The Sahabah (RA) were the best images of Rasulullaah (SAW)’s life. While they strongly opposed any Bid'ah, they had tremendous fervour to emulate everything Rasulullaah (SAW) did. Volumes can be filled with accounts of this, but we will suffice with just a few. Rasulullaah (SAW) once mounted the pulpit and instructed the people to sit. When Hadhrat Abdullaah bin Mas’ood (RA) who was at the door of the Masjid heard this, he immediately sat where he was, even though the instruction was for those inside the Masjid. Rasulullaah (SAW) was once leading the salaah when he suddenly removed his shoes. Seeing this, the Sahabah (RA) immediately removed their shoes as well. When the salaah was over, Rasulullaah (SAW) asked them why they had removed their shoes and they submitted that they had done so because he had done so. Rasulullaah (SAW) then explained that he had removed his shoes because Hadhrat Jibra’eel (RA) told him that there was some impurity beneath it. Rasulullaah (SAW) advised people that when they become angry, they should sit if they are standing and lie down if they are sitting. Hadhrat Abu Dharr (RA) was drawing water in an orchard one day when a person did something that caused all the water to flow outwards rather than inwards. This made Hadhrat Abu Dharr (RA) very angry, but, recalling the instruction of Rasulullaah (SAW), he immediately sat down even though his clothing became wet and muddy in the water. Hadhrat Abdullaah bin Umar (RA) knew all the places en route to Makkah where Rasulullaah (SAW) performed salaah or did anything and would also perform salaah and do the same act wherever Rasulullaah (SAW) did so. In fact, he even stopped in a valley between Arafaat and Muzdalifah to make wudhu at a place where Rasulullaah (SAW) made wudhu. Like these, there are numerous other incidents of the love the Sahabah (RA) had for Rasulullaah (SAW). When they could not allow his spit to touch the ground, would they ever allow his Sunnah to be trampled upon. The following treatise by Dr. Abul Hasan Hussain Ahmed is probably the most in-depth research and defence in English of the major proofs to establish the view that in the time of the Companions (Sahaba) they prayed 20 rak’ats of Salatul Taraweeh in congregation. Hence, this is what they would have received from the practice of the Prophet (sallallahu alaihi wa sallam) who lead Salatul Taraweeh in congregation for only a few nights in his time and then used to pray them on an individual basis. The position for a minimum of 20 rak’ats is that which is also the most famous position emanating from the major Mujtahid Imams from the pious predecessors (Salaf-us-Salihin), like Abu Hanifa (d. 150 AH), Malik ibn Anas (d. 179 AH), al-Shafi’i (d. 204 AH) and Ahmed ibn Hanbal (d. 241 AH). In this age of technology, it has become easy to claim something and cut and paste a barrage of references by most “researchers”, but how many people have the time, stamina and resources to check each and every reference that a party echoes forth as proof and contention for its arguments?! The principle objective of this treatise will be to examine and defend the authenticity of the major narration for 20 rak’ats of Taraweeh in the time of the Amir al-Mu’minin, the second Caliph, Umar ibn al-Khattab (radhiallahu ‘anhu), which has come via the route of the trustworthy narrator, Yazid ibn Abdullah ibn Khusayfa from the Sahabi, Saa’ib ibn Yazid (ra). In doing so, the alternate narration from the trustworthy narrator known as Muhammad ibn Yusuf from his uncle, the same noble Sahabi, Saa’ib ibn Yazid, apparently mentioning 8 rak’ats of Taraweeh in the time of Umar ibn a Khattab (ra) will be shown to have a Shadh (aberrant) wording. Supporting narrations for 20 rak’ats in the time of Umar ibn al Khattab (ra) will also be mentioned. In the latter part of this treatise, an examination and demonstration of why the variant narration for 8 rak’ats of Taraweeh as attributed back to the noble Sahabi, Jabir ibn Abdullah is also weak will be demonstrated, as well as an explanation of how the Ulama (scholars) understood A’isha’s (ra) narrations on 8 rak’ats. Let us now move onto observe the claims made by some and how they are answerable without bias and distortion. Please note the password to view the PDF below. Is Taraweeh 8 or 20 rak’ats according to some Hanafi ‘Ulama or not? by the late Mufti Sayyid Abdur Rahim Lajpuri of India. Moulana Muntasir Zaman has completed 1 year of his Iftaa course. As part of his thesis, he has chosen to translate the section of Tarawih of I’laaus Sunan which deals with 4 important aspects of Tarawih. The article makes useful read and well substantiated. With the blessed month of Ramadān drawing near, many students and scholars have begun their preparation by reading relevant works and discussions pertaining to Ramadān, among which are issues relating to Salāt al-Tarāwih. Although countless books are available on the topic, many people are asking for a treatise that adequately covers the major and necessary aspects. For such a need, it would be advisable to read the chapter on Tarāwīh in the monumental work I’lā’ al-Sunan of ‘Allāmah Zafar Ahmad ‘Uthmānī, as it is a comprehensive chapter that deals with the relevant discussions pertaining to Salāt al-Tarāwīh. There are numerous discussions found in this chapter that are seldom found in other books, like the proofs for making one complete recital of the Qur’ān in the Tarāwīh prayer. In view of the benefit and importance of the chapter, it was advised that an English translation be rendered for non-Arabic speaker. In compliance with this advice, we present the following translation, asking Allāh to make it a means of benefit for scholarly and non-scholarly readers alike. To make the article more reader-friendly, an idiomatic translation was adopted in several places and subtitles were added. In several places where the full name of the author or book was not mentioned, the translator has taken liberties in writing out the complete title. Undoubtedly, Allāh Most High enjoined the fast of Ramadān upon you, and I have made it a Sunnah for you to spend its nights in prayer. Whoever fasts in it and spends its nights in prayer out of faith and hope for reward will emerge from his sins like the day his mother gave birth to him. Al-Nasa’ī narrated it via a sound chain and remained silent regarding it (308:1). The words, “I have made it a Sunnah for you to spend its nights in prayer” clearly indicates that spending the nights of Ramadān in worship is a Sunnah, and this refers to Salāt al-Tarāwīh by consensus as al-Kirmānī articulated, which will come later. It is established from this that the basis of spending the nights of Ramadān in prayer is the Sunnah of the Messenger of Allāh (peace and blessings be upon him) and not the Sunnah of ‘Umar as some people claim. The Sunnah of ‘Umar is only to congregate behind one Imām, prior to which they would pray in separate groups and tend towards the group with the sweetest voice. Upon this, ‘Umar said, “I see that they have treated the Qur’ān as songs. Listen! By Allāh if I were able to, I would change this.” Shortly afterwards, he instructed Ubayy to lead them all in prayer. One night, the Messenger of Allāh (peace and blessings be upon him) performed Salāh in the Masjid, so people started to pray behind him. The following night, he also prayed, so the number of people grew. Thereafter, they congregated for the third or fourth night, but the Messenger of Allāh (peace and blessings be upon him) did not come out. In the morning, he said, “I saw what you were doing. The only thing that prevented me from coming out was the fear of it being enjoined upon you.” This took place in Ramadān. The indication towards praying in Ramadān in congregation with the Messenger of Allāh (peace and blessings be upon him) is clear. These nights refer to the nights of Ramadān, as explained in another narration. The Messenger of Allāh (peace and blessings be upon him) would encourage [the Sahābah] to pray during the month of Ramadān without making it obligatory upon them. He would say, “Whoever spends the night of Ramadān in prayer out of faith and hope of reward, all his previous sins will be forgiven. The Messenger of Allāh passed away and the matter remained the same during the reign of Abū Bakr and the beginning of ‘Umar’s reign. The indication towards the virtue of the prayer of Ramadān known as Tarāwīh is evident. The details will be mentioned shortly. We fasted with the Messenger of Allāh (peace and blessings be upon him) [i.e. in Ramadān], and he did not lead us in prayer until there were seven days left in the month, then he led us in prayer until one third of the night passed. Thereafter, he did not lead us in prayer when six days remained, but led us in prayer when five days remained until half of the night passed. Its indication towards establishing Tarāwīh in congregation from the Messenger of Allāh (peace and blessings be upon him) is clear. Moreover, we learn that he led the congregation by making an announcement, based on the words “he gathered his family and wives, and he led us in prayer until we feared that we would miss al-Falāh.” This is the premise of those who opine that to perform it in congregation is a Sunnah, in addition to the persistence of the Sahābah to perform it in congregation. There is no clear narration whether he prayed Tahajjud separately or not. Are they two distinct prayers? Apparently, they are two distinct prayers, as the difference in the chapter titles of the narrations pertaining to the encouragement of praying night prayers (Qiyām al-Layl) and the prayers of Ramadān (Qiyām Ramadān) indicate. Another proof is that the fast of Ramadān was enjoined in Madīnah by a verse of Sūrat al-Baqarah whilst the Tahajjud prayer was legislated prior to that in Madīnah when Sūrat al-Muzammil was revealed. The poor usage of language in this passage [in Arabic] needs no explanation. It was mentioned earlier that the virtue of Qiyām al-Layl would be attained by performing the Sunnahs of ‘Īshā’ and Witr. Thus, to a greater extent it should be attained by the prayer of Ramadān. It appears from the condition of the Messenger of Allāh (peace and blessings be upon him) that he would perform Tahajjud in Ramdān, besides the Tarāwīh prayer, because he would exert himself more in Ramadān as distinguished from other months, as will be discussed later. This is supported by a narration wherein it is mentioned that in Ramadān the Messenger of Allāh (peace and blessings be upon him) would pray twenty rak‘āt at night. It is evident that that these twenty were besides Tahajjud. One night in Ramadān, the Messenger of Allāh (peace and blessings be upon him) came and saw a group of people performing Salāh in one corner of the Masjid, so he asked, “What are they doing?” Someone replied, “O Messenger of Allāh, they are a people who do not know the Qur’ān, and Ubayy ibn Ka‘b is reciting, so they are praying behind him.” He said, “They have done a good thing.” He did not disapprove of their action. This narration clearly points out the approval of the Messenger of Allāh regarding Salāt al-Tarāwīh in congregation. Hence, it is a Sunnah by approval and agreement. Its indication towards eight rak‘āt of Tarāwīh in congregation and Witr in congregation is evident. More than that has not been explicitly proven from the Prophet via an authentic transmission. During the reign of ‘Umar, the matter settled upon twenty rak‘āt. From the time of ‘Umar, we would pray twenty rak‘āt (of Tarāwīh) and Witr. During the reign of ‘Umar, they would pray twenty rak‘āt in the month of Ramadān. He said, “They would recite from al-Mi’īn (those Surahs that contain approximately one hundred verses) and they would take support from their sticks during the reign of ‘Uthmān ibn ‘Affān due to length of their prayers. The similarity between this narration and the narration before it is evident as is the following narration. ‘Umar ibn al-Khattāb instructed a person to lead them in prayer, twenty rak‘āt. He (i.e. Ibn Abī Shaybah) said: Wakī‘ narrated to us from Mālik ibn Anas, from Yahyā ibn Sa‘īd, and he mentioned the above narration. I say: the transmitters are reliable. However, Yahyā ibn Sa‘īd al-Ansārī did not meet ‘Umar. During Ramadān in Madīnah, Ubayy ibn Ka‘b would lead the people in twenty rak‘āt of prayer, and he would pray three rak‘āt of Witr. He (i.e. Ibn Abī Shaybah) said: Humayd ibn ‘Abd al-Rahmān narrated to us from Hasan, from ‘Abd al-‘Azīz ibn Rufay‘, he narrated the narration above. I say: ‘Abd al-‘Azīz did not meet Ubayy. One night in Ramadān, ‘Umar and I went to the Masjid, and the people were in separate groups: some were praying individually while another was leading a congregation. ‘Umar said, “I feel it would be better if I gathered everyone behind one reciter.” Thereafter, he was determined, so he gathered them behind Ubayy ibn Ka‘b.On another night, I came with him and the people were praying behind their reciter, so he said, “What an excellent innovation. The potion you spend in sleep is more virtuous than the portion you spend in worship.” He intended the last portion of the night. The people (in those days) would spend the first portion in worship. This clearly indicates towards Salāt al-Tarāwīh in congregation, and that the most virtuous time is the last portion of the night, although due to an external factor, that is the fear of missing it, it should not be delayed until the last portion of the night, as Ibn ‘Ābidīn al-Shāmī quotes from Ibrāhīm al-Halabī from Imdād al-Fattāh (737:1). ‘Umar called for three reciters and asked them to read. Thus, he appointed the one who recited the fasted to lead the people with thirty verses in every rak‘āt, the moderate reciter with twenty-five verses, and the slowest reciter with twenty verses. Narrated by al-Bayhaqī via his transmission. (‘Umdat al-Qārī’, 598:3) I have not come across its chain of transmission, but it will not be lower than weak. In Kanz al-‘Ummāl, he (i.e. ‘Alī al-Muttaqī) ascribed it to the Sunan of Ja‘far al-Firyābī. This narration clearly indicates towards the method of reciting Qur’ān in Tarāwīh. Furthermore, know that according to us, Tarāwīh is Sunnah Mu’akkadah in congregation alongside a completion of the Qur’ān. There is a difference of opinion in this regard, and this is not hidden from those who are acquainted with the works of Fiqh and ‘Umdat al-Qārī’. It is reported from the Messenger of Allāh, “Follow the Khulafā’.” It is reported from ‘Umar that he would perform it in congregation. This is the opinion of al-Muzanī, Ibn ‘Abd al-Hakam, and a group of Imām Abū Hanīfah’s students. Imām Ahmad mentioned, “Jābir, ‘Alī, and ‘Abd Allāh (Allāh be pleased with them) would perform it in congregation.” Al-Tahāwī mentioned, “Whoever wishes to pray individually should ensure that it be done such that the congregation in the Masjid does not break due to it. If it does lead to the congregation in the Masajid breaking, it will not be permissible.” A similar opinion has been reported from al-Layth ibn Sa‘d. One night they came, but the Messenger of Allāh did not come out, so they raised their voices and threw pebbles at the door. Then the Messenger of Allāh came out angrily and said, “You continuously did what you were doing until I thought that it was going to be enjoined upon you. Therefore, pray in your homes, as the best of one’s prayer is in his home except the obligatory prayers. Narrated by Muslim. The statement, “When a congregation prays with the Imām until he completes, they will receive the reward of appending the entire night in prayer” is general, and this Hadīth specifically refers to the prayer of Ramadān. Thus, it will be given precedence over the generality of their proof. Further, the statement of the Prophet (i.e. pray in your homes…) was due to the fear of it becoming obligatory upon them. It was for this reason that the Prophet himself did not continue to pray i.e. due to the fear of it becoming obligatory. Now, this fear does not exist. From them (i.e. the Sunan of Tarāwīh) is to perform it in the Masjid in congregation, because whenever the Prophet (peace and blessings be upon him) performed Salāt al-Tarāwīh he did so in congregation in the Masjid. Likewise, the Sahābah performed it in the Masjid in congregation. Thus, it will be Sunnah to perform it in the Masjid in congregation. After an extensive search, I have not come across any evidence that supports this be it weak or strong, be it the statement of the Prophet or the statement of a Companion, not even acceptable analogy, which cannot establish a Sunnah. As for the narration of al-Bayhaqī, it only proves that the minimum Sunnah of ‘Umar is to complete the Qur’ān twice, because whoever performs Tarāwīh with twenty verses (in each raka‘ah) -as ‘Umar instructed- then two completions of the Qur’ān will be made in one month if the days are thirty. Yet, none of our scholars opined that completing the Qur’ān twice is a Sunnah, so Allāh knows best what their evidence is for it being a Sunnah. This indicates that the issue in reference has not been transmitted from the Imām of the madhhab. The above statement of the author of al-Hidāyah “Most of the scholars are of the opinion…” indicates towards this as well, as he did not ascribe this to the Imām of the madhhab or to his two students (i.e. Imām Abū Yūsuf and Imām Muhammad). There is no indication therein that it is Sunnah according to the Imām, it is only consultation and advise (how much should be read). Further, the author of Rahmat al-A’immah (i.e. Abū ‘Abd Allāh al-Dimashqī) did not relate this issue from any of the four Imāms. If the quotation were authentic, it would serve as an evidence for the objective. There is an indication therein that their gathering for the prayer of Ramadān was only for the completion of the Qur’ān. This is because the statement “they are a people who do not have the Qur’ān” does not mean that they were unable to recite the required amount for the validity of Salāh, as that is highly unlikely from the Sahābah, who resided in Madīnah. Rather, it means that they did not know the entire Qur’ān. ‘Umar ibn al-Khattāb instructed him to lead the congregation at night in Ramadān, and he said “Undoubtedly, the people fast during the day, and they are not good at reciting, so you should recite for them at night (i.e. in prayer).” He replied, “O Amīr al-Mu’minīn, this is unprecedented.” ‘Umar said, “I know, but it is good.” Thus, he led them in twenty rak‘āt. It is mentioned in Kanz al-‘Ummāl without the chain, but it is not lower than weak. In addition, it was mentioned earlier that during the reign of ‘Umar, they would pray twenty raka‘ah in Ramadān, and would recite from the Mi’īn (i.e. those Sūrahs that contain approximately one hundred verses). During the reign of ‘Uthmān, they would take support from their sticks due to the length of the prayer. After this, is it possible to assume that they would not make a completion of the Qur’ān despite enduring such difficulty, and abandon the virtue of completing the Qur’ān despite the Imām being a Hāfiż? Never! There is no scope for such an assumption besides an assumption that stems from a mere rational estimation, which has no place in this discussion. Therefore, it is proven that completing the Qur’ān in the prayer of Ramadān is Sunnah based on the persistence of the Sahābah upon it during the reign of ‘Umar and ‘Uthmān (Allāh be pleased with them). As for the objection of some people regarding the narration of al-Bayhaqī from Abū ‘Uthmān al-Nahdī, “’Umar summoned three reciters and asked them to recite…” that it indicates towards the minimal Sunnah of ‘Umar being the completion of the Qur’ān twice, which none of our scholars opine. The answer is that the narration is not void of an indication towards the completion of Qur’ān being a Sunnah; otherwise, ‘Umar would not summon the reciters and ask them to recite. Moreover, he would not differentiate between the fastest, moderate, and slowest reciters, but would instruct them not to pay attention to completing the Qur’ān, and to suffice on a recitation that would be easy for the congregation. How could it be assumed that ‘Umar would go to such lengths, summon the reciters, and stipulate their respective amounts, yet the completion of the Qur’ān would not be a Sunnah and remain only as a voluntary act? It is evident that such care and particularity will not be given to a solely voluntary act. As for the claim that it indicates towards two completions of the Qur’ān, there is no such indication in this report until it is proven that ‘Umar (Allāh be pleased with him) instructed them to recite thirty, twenty-five, and twenty verses in every night of Ramadān, from the beginning to the end. There is no such proof, as the narration is silent regarding that. It is possible that he gave them that instruction because he knew that the completion would not take place with a recitation below twenty verses due to the remainder of the nights being few. This is because in the year he gathered the people, ‘Umar did not gather them behind one Imām from the first night. Rather, in light of the narration mentioned in the text, and what we mentioned in the commentary, he gathered them many days after. Many people informed me that ‘Umar ibn ‘Abd al-‘Azīz instructed the reciters to carry that out and recite ten verses in every raka‘ah. This is similar to consensus. Thus, it is proven that the Sunnah is to recite ten verses in every raka‘ah of Tarāwīh. This is also the view of Imām Abū Hanīfah transmitted by al-Hasan, as mentioned earlier. There is no consensus in praying thirty-nine due to the difference of the people of Makkah and the cities of the Muslims in that, as the majority of cities would pray twenty-three besides the people of Madīnah. The recommended duration of sitting between two Tarwīhah (sets of four raka‘ah) is the duration of one Tarwīhah. Likewise, between the fifth Tarwīhah and Witr, due to the practice of the people of the two Harams. Al-Tarāwīh is the plural of Tarwīhah, and a single event of resting, just like Taslīmah from Salām. The prayer in congregation during the nights of Ramadān is called Tarāwīh because the first time they gathered for Salāt al-Tarāwīh they would rest in between the two Taslimahs (two sets of Salāms i.e. four rak‘āt). Muhammad ibn Nasr penned two chapters concerning the prayer of the night: one for those who preferred voluntary prayers between the two Tarwīhah, and the second for those who disliked it. He reported from Yahyā ibn Bukayr, form al-Layth that they would rest the duration a person could pray so many rak‘āt. I have not come across the chain, but it will not be lower than weak. Al-Layth who is mentioned is Ibn Sa‘d a reliable, accurate, jurist, and a renowned Imām from the senior Tābi‘ūn except that the incident has not been mentioned with a sanad. Whatever the case may be, unconditional Istihbāb (of Tarwīhah) cannot be proven based on what has been mentioned, because the purpose (of Tarwīhah) is to rest, and not every Imām is in need of it, particularly in between the two Taslīmah’s unless it is said that the need to stipulate a general principle demands that. Furthermore, our scholars opined that it should be after every four rak‘āt, because in al-Kifāyah it is mentioned “In this situation, Tarwīhah refers every four rak‘āt.” There is no proof for this specification. As for the usage of Tarwīhah for four, it is mentioned in a weak report of al-Bayhaqī. Most likely the weakness stems from the narrator, Abū Sa‘d Sa‘īd ibn al-Marzubān al-Baqqāl, as he is criticized. If this is the case, then others have corroborated him in this report. Ibn Abī Shaybah says: Wakī‘ narrated to us from al-Hasan ibn Sālih, from ‘Amr ibn Qays, from Abū al-Hasnā’ that ‘Alī (Allāh be pleased with him) instructed a person to lead them in congregation in Ramadān, twenty raka’ah. He is a reliable Mudallis. Abū Usāmah said: Sa‘īd ibn al-Marzubān narrated to us and he is reliable. Abū Zur‘ah said, “He is lenient in Hadīth and a Mudallis. It was asked, ‘Is he truthful?’ He replied, ‘Yes, he would not lie.’ Shu‘bah, both the Sufyāns, al-A‘mash and others narrated from him, and Shu‘bah only narrates from reliable narrators. Thus, he is sound in Hadīth and others have corroborated him, so the report will gain strength. How could he be unknown when Sharīk narrates from him in (Sunan of) Abū Dāwūd and in (al-Sunan al-Kabīr of) al-Bayhaqī, and ‘Amr ibn Qays narrates from him in (al-Musannaf of) Ibn Abī Shaybah. Abū Dāwūd remained silent about him, and al-Mundharī in al-Talkhīs (i.e. remained silent as well) and only pointed a defect in the Hadīth looking at the narrators, Hanash and Sharīk, and did not criticize him (i.e. Abu ‘l-Hasnā’) at all, as is evident from al-‘Awn (al-Ma‘būd 50:2). In his Musannaf, Ibn Abī Shaybah narrates: Ghundar narrated to us, from Shu‘bah, from Khalaf, from Rabī‘-he praised him abundantly- from Abu ‘l-Bakhtarī that in Ramadān, he would pray five Tarwīwah and three rak‘āt of Witr. In this chain is the narrator Khalaf; I do not know who he is. It is not necessary to know him, because Shu‘bah only narrates from reliable transmitters. My assumption is that he is Khalaf ibn al-Hawshab who is reliable and from the sixth category, as mentioned in Taqrīb al-Tahdhīb (p. 53). Shu‘bah narrated from him, as mentioned in Tahdhīb al-Kamāl (p. 149). The remaining transmitters are all reliable. Thus, the report is sound. These reports show the persistence of the senior Tābi‘ūn (Allāh be pleased with them) upon five Tarwīhah in Salāt al-Tarāwīh, in particular Suwayd ibn Ghafalah as he was a Mukhadram, accepted Islām during the life of the Prophet (but never met him). They could have only taken it from the Khulafā’ and the eminent Sahābah. Moreover, this supports the report of Zayd in Wahb that ‘Umar would let them rest in Ramadān i.e. between the Tarwīhah, because the concurrence of the practice and verdicts of the jurist with a Hadīth is an indication of its authenticity, as we mentioned in the introduction. I asked Imām Mālik regarding voluntary prayers in between the two Tarwīhah, so he replied, “There is no problem provided he makes rukū‘, sajdah, and salām.” Ibn Wahb mentions, from Ibn Lahī‘ah, from Ibn al-Hādī who said, “I saw ‘Āmir ibn ‘Abd Allāh ibn al-Zubayr, Abū Bakr ibn Hazm, and Yahyā ibn Sa‘īd pray between the sets. Al-Mudawwanah (195:1). This is an indication that it is undesirable (Khilāf al-Awlā). From the Sunan of Tarāwīh is that the Imām should rest between two Tarwīhah the duration of one Tarwīhah and say Subahānallah, La ilāha Illahhah, Allāhu Akbar, and send salutations upon the Messenger of Allāh. He should also wait after the fifth Tarwīhah for the duration of one Tarwīhah. This was passed down from the Salaf. As for resting after five Taslīmah, some opine that it is recommended while others say that it is not recommended and this is the correct view as this practice is contrary to the practice of the Salaf. By “Salaf” he means the Sahābah and the Tābī‘ūn (Allāh be pleased with them). In light of the above, we learn that the prayer of Ramadān is Sunnah with eleven rak‘āt and witr in congregation. The Messenger of Allāh did this after which he abandoned it due to an excuse, which indicates that were it not for that fear he would have continued with them. Since that that fear no longer exists, it will be Sunnah. Moreover, it being twenty rak‘āt is the Sunnah of the rightly-guided Khulafā’. The statement of the Messenger of Allāh, “Hold firm to my Sunnah and the Sunnah of the rightly-guided Khulafā’” is only is an encouragement to their Sunnah and does not necessitate that it (Twenty rak‘āt) is Sunnah, because his Sunnah is what he himself adheres to except for an excuse. Assuming that excuse is absent, we derive that he would have persisted on what had transpired, and that is what we mentioned. Therefore, twenty will be recommended, and that amount will be Sunnah. According to me, this is the correct view, and the statement of the author of al-Hidāyah, “because the rightly-guided Khulafā’ were punctual upon it” is clearly incorrect. This is because Abū Bakr (Allāh be pleased with him) did not pray twenty rak‘āt neither did he pray Tarāwīh in congregation. As for ‘Umar and ‘Uthmān (Allāh be pleased with them) it is not proven that they prayed twenty rak‘āt in congregation. Yes, ‘Umar (Allāh be pleased with him) assembled the people for that, and it is not proven from ‘Uthmān and ‘Alī (Allāh be pleased with them) that they objected to it, so it will be taken as approval from them. As for the statement of al-Tirmidhī reported from ‘Alī and ‘Umar, the report of ‘Umar was mentioned in the text, and the report of ‘Alī is what is mentioned in Kanz al-‘Ummāl from Abu ‘l-Hasnā’ that Alī ibn Abī Tālib instructed a person to lead the people in five Tarwīhah, twenty rak‘āt. Al-Bayhaqi narrated it and classified it weak. This is an innovated stance that contravenes consensus, as the four Imāms who are followed in matters of religion have differed regarding the number rak‘āt that is Sunnah with two views. According to Imām Abū Hanīfah, Imām al-Shāfi‘ī, and Imām Ahmad it is twenty rak‘āt, and it is narrated from Imām Mālik that Tarāwīh is thirty-six rak‘āt, as mentioned in Rahmat al-Ummah (p. 23). When the ummah differs concerning one issue in any era, it will be regarded as consensus that all other views are invalid, and it is impermissible for those afterwards to form a separate view; this is expressly mentioned in Nūr al-Anwār (p. 223) among other books of ‘Usūl al- Fiqh. Without a doubt, not a single Imām held the view that Ibn al-Humām mentioned. Rather, they all are unanimous that it should be twenty, except that Imām Mālik increased an additional eleven rak‘āt. However, no one has decreased the number. Thus, whoever says that the Sunnah is eleven rak‘āt and the remainder is merely recommended, his statement is refuted by the consensus before him. This is in spite of the fact that the statement of Ibn al-Humām is invalid in light of textual and rational proofs. As for the rational proof, this is because he premised his conclusion on the Sunnah being what the Messenger of Allāh (peace and blessings be upon him) himself was persistent upon, and regarded what the rightly-guided Khulafā’ were persistent upon only a recommended act, which is contrary to the position of the verifiers and experts from the jurists and theoreticians. The is because according to them the Sunnah is what the Messenger of Allāh or the rightly-guided Khulafā’ were persistent upon, due to them (i.e. the jurists and theoreticians) clearly stating that twenty rak‘āt of Tarāwīh in congregation is Sunnah based on their (i.e. the Rightly Guided Khulafā’) persistence upon that. The statement of the Prophet, “Hold firm unto the Sunnah of the Rightly Guided Khulafā’; hold unto it with your molars” supports this. Al-Tirmidh narrated it and said, “This narration is Hasan Sahīh.” The word “Hold firm (‘alaykum)” lexically indicates towards obligation, and linguistically the Ma‘tūf will share the same ruling as the Ma‘tūf ‘alayh. Thus, it is proven that the obligation of the Sunnah of the Rightly Guided Khulafā’ is similar to the obligation of the Sunnah of the Messenger of Allāh, so it is incorrect to differentiate between them by classifying one as Sunnah and the other as recommended, because a recommended action cannot be obligatory. I asked my lord about the differences of my companions after me, so He revealed to me, “O Muhammad, undoubtedly your companions in my sight are similar to the stars in the heavens: some are brighter than others, and each one contains light. Whoever adheres to any view from their difference, in my sight he is upon guidance.” Narrated by Razīn, as mentioned in al-Mishkāh (p. 473). It is evident that the Messenger of Allah encouraged us to follow the Sunnah of the Khulafā’, in particular the Sunnah of Abū Bakr and ‘Umar, such that he did not encourage to follow the Sunnah of the other Sahābah in a similar manner. It would be more appropriate if Ibn al-Humām said that the Sunnah Mu’akkadah in the prayer of Ramadān is twenty-three rak‘āt and eleven of those rak‘āt are more emphasized based on the reasons we have mentioned above, because some Sunnah Mu’akkadah are more emphasized than others are. I asked Abū Hanīfah regarding Tarāwīh and the action of ‘Umar (Allāh be pleased with him). He said, “Tarāwīh is Sunnah Mu’akkadah. ‘Umar did not invent it himself and he is not an innovator in that. He only gave instructions due to a basis according to him and precedence from the Messenger of Allāh (peace and blessings be upon him). Marāqi ‘l-Falāh quoting al-Ikhtiyār, (p. 239). There is an indication in this passage that Tarāwīh is Sunnah Mu’akkadah in the manner instructed by ‘Umar and that is twenty rak‘āt. The Messenger of Allāh would exert himself more in Ramadān as distinguished from other months. During the (last) ten days of Ramadān, the Prophet would tighten his waist belt (i.e. exert himself or stay away from his wives), remain awake at night, and keep his family awake. When Ramadān would commence, the Prophet would tighten his waist belt and would not return to bed until the culmination of the month. The chain of this narration is sound. When Ramadān would commence, his color would change, his prayers would increase, he would supplicate in humility, and his complexion would become pale, as mentioned in al-‘Azīzī, (127:3). Yazīd ibn Hārūn narrated to us, he said: Ibrāhīm ibn ‘Uthmān informed us from al-Hakam, from Miqsam, from Ibn ‘Abbās that in Ramadān, the Messenger of Allāh (peace and blessings be upon him) would perform twenty rak‘āt of Tarāwīh and Witr. Narrated by al-Kashshī in his al-Musnad, al-Baghawī in his al-Mu‘jam, al-Tabrānī in his al-Kabīr, and al-Bayhaqī in his al-Sunan, as it is mentioned in al-Ta’līaq al-Hasan. There is a difference of opinion regarding Ibrāhīm ibn Hayyah, and he is sound in his narrations. ‘Uthmān al-Dārimī relates from Yahyā ibn Ma‘īn, “He is trustworthy, a shaykh.” Lisān al-Mizān, (53:1). Thus, he (i.e. Ibrāhīm ibn ‘Uthāmn) who is better than him (i.e. Ibrāhim ibn Hayyah) is not below “a narrator regarding whom there is a difference of opinion, and his narrations are sound.” Moreover, it is explicit in what the authentic narrations mention concisely in that the Prophet (peace and blessings be upon him) would pray more in Ramadān. As for the statement of Ibn al-Humām, “This report is weak due to Abū Shaybah Ibrāhīm ibn ‘Uthmān, whose weakness is unanimously agreed upon in addition to its conflicting with authentic narrations” it is invalid based on what we mentioned i.e. Ibn ‘Adī gestured towards his reliability and preferred him over such a narrator who is sound in his narration in light of their principles. Moreover, he mentions, “In brief, a non Marfū‘ narration or a Marfū‘ narration that was superseded by another Marfū‘ narration is often preferred over its equivalent when it is supported by indications that it is authentically proven from the Prophet (peace and blessings be upon him) and continuously upon it. The statement of al-Tirmidhī, “The practice of the people of knowledge is upon this” strengthens the origin even though the specific route is weak. From the people of knowledge, who is more virtuous than the Companions? Then how could their practice not be a proof for the strength of the origin? Thus, the reality is that the report if it is not authentic, it is not less than a sound narration. As for the statement “in addition to it conflicting with authentic narrations,” we have already answered it by proving that the report only conflicts with authentic narrations according to Ibn al-Humām. This is because he interprets the statement of ‘Ā’ishah “he would not exceed eleven rak‘āt in and out of Ramadān” on the entire prayer of the night, which is incorrect. Rather, the correct interpretation is that it refers to the entire amount of Tahajjud he would pray after waking up. We also proved that the interpretation of the narration of ‘Ā’ishah made by Ibn al-Humām goes against the narrations that describe the additional exertion of the Prophet (peace and blessings be upon him) in Ramadān. Thus, it is necessary to interpret the narration as we have done, by which there remains no conflict between the report of Ibn Abī Shaybah and the narration of ‘Ā’ishah in Ramadān. Rather, the report of Ibn Abī Shaybah is in conformity with all the narrations of ‘A’ishah that mention the exertion and extra prayer of the Prophet (peace and blessings be upon him) in Ramadān as distinguished from other months. Further, it is also supported by the persistence of the Khulafā’ and Companions and their consensus on twenty rak‘āt besides Witr in the nights of Ramadān. Which indication can be stronger than this to prove its authenticity? In addition, the narrations of ‘Ā’ishah that describe the prayer of the Prophet during the night appeared problematic to some scholars such that they have declared them inconsistent (Muttarib). Hāfiż Ibn Hajar mentions this, and we indicated towards in the chapter of witr. Thus, Abū Salamah narrated from her that he would not exceed eleven rak‘āt in and out of Ramadān. Hishām ibn ‘Urwah narrated from his father, from her that the Messenger of Allāh would pray thirteen rak‘āt thereafter, he would pray two short rak‘āt when he would hear the Adhān of Fajr. Narrated by al-Bukhārī, (Fath al-Bārī 37:3). Assuming the absence of the excuse (i.e. fear of it becoming obligatory), it only shows that he was persistent on what had transpired and that is what we mentioned (i.e. eleven rak‘āt). Accordingly, (performing) twenty (rak‘āt) will be recommended whilst that amount (eleven) will be Sunnah. In fact, it is more likely that had it not been for the excuse, he would have persisted on what the Khulafā’ after him and the Sahābah persisted on, particularly when his persistence on twenty is proven from the report of Ibn ‘Abbās, which has a sound chain, as we have proven. Even if we accept that it (i.e. the report of Ibn ‘Abbās) is weak, it gains strength by the practice of the Companions and the Khulafā’. Therefore, performing twenty rak‘āt and witr in Ramadān is Sunnah Mu‘akkadah, and the one who abandons it will be considered a deviant, and the one he is deficient in it will be reprimanded. ‘Umar instructed Ubayy ibn Ka‘b and Tamīm al-Dārī to lead the people in eleven rak‘āt. The Qārī’ would recite from al-Mi‘īn until we would have to take support from sticks due to the length of standing. ‘Āthār al-Sunan (52:2). Others besides Mālik have narrated this Hadīth with “twenty-one” and that is correct. I do not know of anyone who mentioned the Hadīth with “eleven rak‘āt” besides Imām Malīk…According to me, most probably the words “eleven” is a mistake. Al-Ta‘līq al-Hasan quoting from al-Zurqānī in the commentary of al-Muwatta’. Mālik did not err in this because two others have corroborated him in it from Muhammad ibn Yūsuf, as he mentioned once, “twenty-one” and once, “eleven” and once, “thirteen.” It is unnecessary and far-fetched to reconcile between them by applying them to different states as al-Hāfiż and others mention, as the source is one, so how could it be correct to apply it to different states? The preserved report (al-Mahfūż) is what Yazīd ibn Khusayfah narrates from al-Sā’ib ibn Yazīd, he said, “During the reign of ‘Umar ibn al-Khattāb, in Ramadān, they would pray twenty rak‘āt” as we mentioned in the text. Narrated by al-Bayhaqī and its chain is authentic. In Fath al-Bārī, al-Hāfiż ascribes it to Mālik as well (219:4) as there are many supporting narrations for it. Mālik narrated from Yazīd ibn Rūmān that he said, “During the reign of ‘Umar ibn al-Khattāb, in Ramadān, people would pray twenty-three rak‘āt (i.e. alongside witr)” and its chain is a strong Mursal. It is narrated from Yahyā ibn Sa‘īd that ‘Umar ibn al-Khattāb ordered someone to lead them in twenty rak‘āt of prayer” and its chain is a strong Mursal. It is narrated from ‘Abd al-Azīz ibn Rufay‘ that he said, “In Madīnah, during Ramadān, Ubayy ibn Ka‘b would lead the people in twenty rak‘āt and would make three (rak‘āt of) witr” and its chain is a strong Mursal. We mentioned all of this in the text. Thus, the narration of Yazīd ibn Khusayfah from al-Sā’ib ibn Yazīd is stronger, better, and more preferred than the narration of Muhammad ibn Yusūf from him (i.e. al-Sā’ib ibn Yazīd), because Yazīd (ibn Khusayfah) did not differ in what he narrated from him as opposed Muhammad ibn Yūsuf as he has differed significantly. Even if we accept the authenticity of ‘Umar instructing Ubayy and Tamīm (Allāh be pleased with them) to lead the people in eleven rak‘āt of prayer, there is no proof therein that ‘Umar would give people the choice between eleven and twenty-three rak‘āt. This is due to the possibility that ‘Umar initially gave the order of eleven, because according to him more than that was not established from the Prophet, after which he gave the order of twenty besides witr, because of what was established according to him that in Ramadān, the Prophet would pray twenty rak‘āt and witr. If his instruction of eleven and twenty-three were optional, the option would have remained after him during the reign of ‘Uthmān and ‘Alī as well. However, it is not reported that they gave people that choice. As for what Mālik narrates in al-Muwatta’ from al-Araj‘ that he said, “I have only found the people cursing the disbelievers in Ramadān” and he said, “The Qāri’ would recite Sūrat al-Baqarah in eight rak‘āt. When he would recite it in twelve rak‘āt, people would assume that it was lightened.” There is no mention therein that he would only pray eight rak‘āt in one instance and twelve rak‘āt in another instance. Rather, it only discusses the amount of recitation in the rak‘āt of Tarāwīh, and that the Qāri’ would recite Sūrat al-Baqarah and its like in eight rak‘āt. There is absolutely no indication therein on the entire amount of rak‘āt. It is possible that he would recite the amount of al-Baqarah only in the entire amount that was eight at one time and twelve at another time, or that he would recite the amount of al-Baqarah in eight rak‘āt and would lighten the recitation after that in the remaining rak‘āt from the twenty. When there exists the possibility of interpretation, the deduction of proof is invalid. The preferred view according Abū ‘Abd Allāh (i.e. Imām Ahmad) in that is twenty rak‘āt, and al-Thawrī, Abū Hanīfah, and al-Shāfi‘ī hold this view as well. Our evidence is that when ‘Umar assembled the people behind Ubayy ibn Ka‘b he would lead them in twenty rak‘āt. Narrated by Abū Dāwūd. Al-Sā’ib ibn Yazīd narrated it, and it is reported from him via several routes. Mālik narrates from Yazīd ibn Rūmān that, “During the reign of ‘Umar, in Ramadān, people would pray twenty-three.” It is narrated from ‘Alī that he ordered to lead them in Ramadān in twenty-three rak‘āt.” This is similar to consensus. As for the narration of Sālih, Sālih is a weak transmitter. Moreover, we do not know the people to whom he is referring. Perhaps he found a group of people doing that, which cannot be taken as evidence. Even if it is proven that all the people of Madīnah would do that, still what ‘Umar did and what the Companions have agreed upon in his time is more worthy to follow. The people of Madīnah only did this because they wanted an equivalent for the practice of the people of Makkah. Since the people of Makkah would perform tawāf seven times between two Tarwīhahs, the people of Madīnah would perform four rak‘āt in place of seven rounds of tawāf. What the Companions have practiced upon is better and more worthy of being followed. Muhammad ibn Nasr narrates via the route of Dāwūd ibn Qays, he said, “During the rule of Abān ibn ‘Uthmān and ‘Umar ibn ‘Abd al-‘Azīz i.e. in Madīnah, I found the people praying thirty-six rak‘āt and performing three rak‘āt of witr. In brief, we have not come across a single report that they prayed less than twenty except what Muhammad ibn Yūsuf narrated. However, we mentioned the inconsistency in its text, and therefore there is no evidence in it. If eleven rak‘āt was Sunnah and the remaining from the twenty was recommended as Ibn al-Humām claims, it would have been reported from the Salaf, and since that is not the case, this view is baseless and it contravenes consensus. The statement of the author of al-Hidāyah, “The rightly-guided Khulafā’ were persistent on it” is a clear mistake, as Abū Bakr never prayed twenty and he did not pray the actual Tarāwīh in congregation. The answer is that the statement “The rightly-guided Khulafā’ were persistent on it” refers to most cases (fihī taghlīb), as it does not refer to all of them, rather ‘Umar, ‘Uthmān, ad ‘Alī. Ibn al-Humām mentioned this in Fath al-Qadīr (407:1). As for his statement, “It is not proven from ‘Umar and ‘Uthmān that they prayed twenty in congregation” perhaps he intended to negate the persistence of the three Khulafā’, and he intended to completely refute the author of al-Hidāyah. However, this stems from a misunderstanding, lack of deep thinking, and unfamiliarity with terminology of the jurists, as the persistence that gives the benefit of it being a Sunnah and emphasis is not restricted to physical persistence. Rather, it is of two types. The first type is that wherein persistence is proven physically and practically, such as the persistence of the Prophet (peace and blessings be upon him) on congregation, Sunan Mu’akkadah etc. The second type is that wherein persistence is found as legislation by encouraging its continuous practice, such as Adhān and Iqāmah. The scholars have unanimously agreed that they are Sunnah knowing well that the Prophet (peace and blessings be upon him) did not give Adhān or Iqāmah himself unless it was uncommon, yet they regard it as Sunnah due to the Prophet legislating its persistence and continuity and encouraging it. After this, even if we accept that the three Khulafā’ were persistence on twenty rak‘āt in congregation, the most that can be proven is the negation of practical persistence from them. However, legislated persistence is proven from them, based on the reports we have just presented. Al-Hāfiż Ibn Qudāmah claims that they have agreed upon it, and he is evidence in transmission as it is evident to those who read his biography. In addition, Imām Ahmad, Allāh have mercy on him, has affirmed that it is reported from ‘Umar that he would pray in congregation. Imām Ahmad mentions, “Jābir, ‘Alī, and ‘Abd Allāh (Allāh be pleased with them) would pray it in congregation.” We have mentioned this before quoting al-Mughnī, and the affirmation of Imām Ahmad is evidence. Should it be prayed individually or in congregation? This shows that ‘Umar (Allāh be pleased with him) prayed it in congregation. This is not in conflict with the report of Ibn Wahb from al-Layth, from Yahyā ibn Sa‘īd that he was asked regarding the prayer of the Amīr behind the Qāri’ and he replied, “It has not reached us that ‘Umar and ‘Uthmān (Allāh be pleased with them) would pray in Ramadān with the people” as mentioned in al-Mudawwanah (194:1). This because the report only negates them praying with the people behind the Qāri’, but it is silent regarding them leading the people in prayer. Furthermore, Yahyā ibn Sa‘īd unawareness does not necessitate that others do not know it. Perhaps it reached Imām Ahmad that ‘Umar (Allāh be pleased with him) would pray in congregation, like ‘Alī, Jābir, ‘Abd Allāh (Allāh be pleased with them) and it was authentic according to him, so he affirmed it. The persistence of one of the Khulafā’ and the concurrence of the remaining Companions will suffice us in it being a Sunnah and emphasized. He summoned the reciters and instructed one of them to lead the people in twenty rak‘āt. He said, “’Alī (Allāh be pleased with him) would perform witr with them,” and it is narrated from ‘Alī via a different route, as mentioned in al-Ta‘līq al-Hasan. Al-Nīmawī mentions, “Hammād ibn Shu‘ayb is a weak narrator (56:2). Thereafter, he quotes the statements of those who classified him as a weak narrator from Mīzān al-I’tidāl. Ibn ‘Adī said, “Despite his weakness, his narrations will be written. In spite of this, al-Hākim narrated this in al-Mustadrak. Therefore, the report is sound in addition to it being narrated via a different route as well. Furthermore, in it there is clear mention of ‘Alī’s instruction of twenty and an indication that he prayed with them, because he would perform witr with them. The objection of making an innovation in religion may be levelled against them, as peforming thirty-six raka‘āt is not established from any f the Khulafā’ and there is no such report from the Companions. Alāh knows best, perhaps they did not make a fixed amount, and they assumed that the Prophet encouraged the people to pray in Ramadān without fixed number of raka‘āt. They considered the Khulafā’s choice of twenty to have fallen under this general encouragement not because of twenty itself such that increasing it would be reprehensible. Thus, because of a particular wisdom, they choice thirty-six laboring under the impression that there is vastness in this regard. As for us, we do not consider it possible to increase above twenty in a general congregation, and we allow it in other than a congregation, because congregation is from the landmarks, so it cannot be legislated unless there is a clear text or persistence from the Companions, and there is no text or persistence over twenty raka‘āt in Ramadan. As for their statement, “The Prophet encouraged praying in Ramadān without a fixed number,” the answer is that he gave a general encouragement, and we are also of that opinin. However, he did not encourage it in congregation without a fixed number, so it is not permissible to pray it in congregation except with number with which it is mentioned in congregation. Allāh knows best. I heard that the prophet(saw) prayed tarawi but he didn’t want people to make it a habit. If that’s true, then why is it sunnah-mu’aqaddah now to pray 20 taraweeh? sometiems I can’t pray tarawaeeh because it takes 2.5 hours at our mosque. can you give a suggestion? can we pray only 8? Taraweeh is twenty Rakaats. This is authentically recorded in their books. Ahle Hadith of recent times, has been unanimous on twenty Rakaats. who contradict them??? You make the decision. twenty rakaats taraweeh in a shorter space of time you may go there.